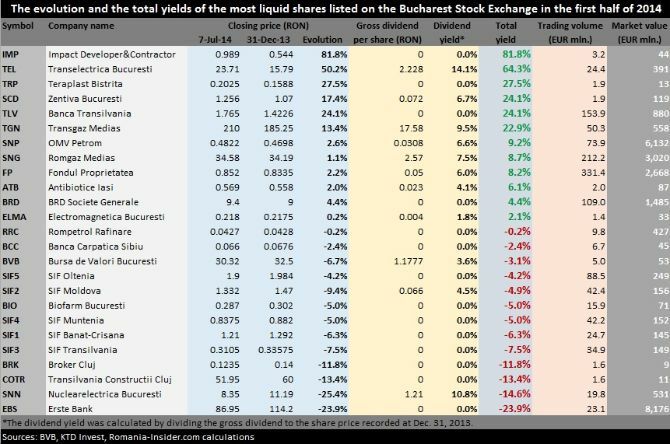 The good performance of the Romanian economy in recent quarters and the growing initial public offering IPO activity on the local capital market caught the eye of international investors who started pouring more money into Romanian shares listed on the Bucharest Stock Exchange (BVB). This is more and more visible both in the daily liquidity of the market but also in the share price evolution of the most important companies. Real estate company Impact (BVB ticker: IMP) and electricity transport company Transelectrica (TEL) are among the highest gainers, compensating their investors with returns of 80 percent, and 64 percent respectively, year-to-date. These also include dividend yields. “Romania benefits from a special economic environment which is visible in the economic growth, which is one of the highest in Europe, in the exports evolution but also in the evolution of domestic demand. And this is more and more visible externally,” Mihai Chisu, stock broker for Swiss Capital, the largest independent brokerage house on the local market, told Romania-Insider.com. The BET index, which follows the shares of the ten most important companies listed on the Bucharest Stock Exchange, gained 9.2 percent since the end of April, while the daily turnover frequently passed the EUR 10 million mark. “We see inflows from foreign investment funds who come to Romania to benefit from these improved economic conditions,” Chisu added. Romania posted a 3.9 percent GDP growth for the first quarter of this year, the highest among the 28 EU member states. The good evolution of macroeconomic indicators as well as progress made by Romania in reducing its external indebtedness and in fiscal consolidation prompted Standard&Poor’s rating agency to upgrade the country’s rating to investment grade. Adding to these the increased weight for Romanian shares in the MSCI Frontier Markets Index and the overall optimistic evolution of international markets in recent months, the current context is very good for the local market. But it was the Romanian state’s listings that really put Romania on the map for international investors. First it was the Government’s sale of 15 percent in Romgaz, for EUR 391 million, in October 2013, then it was Electrica’s 51 percent IPO, in June 2014, in which the company raised EUR 444 million, a record for Romania’s capital market. These transactions were really determinant for international funds’ setting their eyes on Romania, as they previously had few options for large investments on the Bucharest Stock Exchange. “Interest for local shares started growing after the Romgaz listing last year, when we saw both capital inflows and new foreign investors interested in the local market,” said Alexandru Palasan, broker for NBG Securities. Investors marked some of their profits in the first months of this year, somewhat alarmed by the tensions that arose in the region. But once the situation started to deescalate, investors started building back their positions. The frequent visits of U.S. high officials to Romania, starting with Vice President Joe Biden followed by CIA and Pentagon leaders also contributed to reassuring investors that their money is safe in Romania. Brokers speak of a growing interest from U.S. investment funds for Romania. “The announcement that Romania’s weight in the MSCI Frontier index was raised from 1.5 percent to 2.7 percent and the rating upgrade from S&P contributed to growing interest for the local market from existing investors as well as from those less familiar with the local market. If until now we got inquiries mostly from investors specialized on the region, now we got global hedge-funds also asking about Romania,” Palasan added. Efforts made by the Bucharest Stock Exchange to eliminate regulatory barriers for international investors and to make trading in Romania more accessible also contributed to the change in perception. The management of the BVB set the target to get Romania upgraded to emerging market status, which would bring new investors and new capital inflows. So who comes first has the chance to get the most out of the market’s potential. “The Romanian capital market is in a phase in which its potential is being discovered broker Mihai Chisu said. It’s not just foreign institutional investors that are more active on the market, but Romanian institutional and individual investors as well. Local private pension funds’ assets are growing from month to month and have already reached EUR 3.6 billion at the end of May. Some EUR 590 million of this is invested in listed shares. Individual investors are also pouring more money in stocks, as interest rates for bank deposits are at an almost 25 years low. Bank deponents now get less than 3 percent per year for deposits in local currency, and less than 1 percent for deposits in foreign currency, either in dollars or in euros. “The decrease in bank deposit rates generates a money flow towards other investment instruments, including the capital market,” Mihai Chisu, broker for Swiss Capital, explained. “Investors target solid companies, the so called blue-chips, which demonstrate the capacity to generate profits and to pay dividends,” he added. Some of the main criteria for share selection are the size and liquidity of the companies, but also the dividend yields they generate, with utility and energy companies among the favorites. State owned utilities company Transelectrica, which holds the monopoly for electricity high voltage transmission, was the most profitable blue-chip investment so far this year, with a 64 percent return, based on the closing share price at the end of 2013. The company’s share price increased 50 percent, with an extra 14 percent coming from the dividend. Gas transport company Transgaz Medias (TGN) returned almost 23 percent, with the dividend yield contributing 9.5 percent. Oil & gas company OMV Petrom (SNP) and state controlled gas producer Romgaz (SNG), had returns of around 9 percent, mostly from dividends. But it’s not just energy and utilities that compensated their investors. Reals estate developer Impact (IMP) saw its shares rise by 81 percent, while Banca Transilvania, the third local bank by asset value, gained 24 percent. Pharmaceutical producer Zentiva Bucuresti (SCD) also retuned 24 percent. There were, however, some flops as well. Nuclearelectrica (SNN), the state owned company that operates Romania’s Cernavoda nuclear plant, generated a 15 percent loss to its investors this year, in spite of the fact that it paid some of the highest yielding dividends. The decline in share price cancelled the dividend return. The five Romanian investment companies (SIFs) also lost between 4 percent and 8 percent this year. But overall, the market remains interesting for investors and local brokers expect further growth. “The local capital market still has a lot to recover compared to other markets and is only starting to be rediscovered by foreign and local investors,” Mihai Chisu concluded.